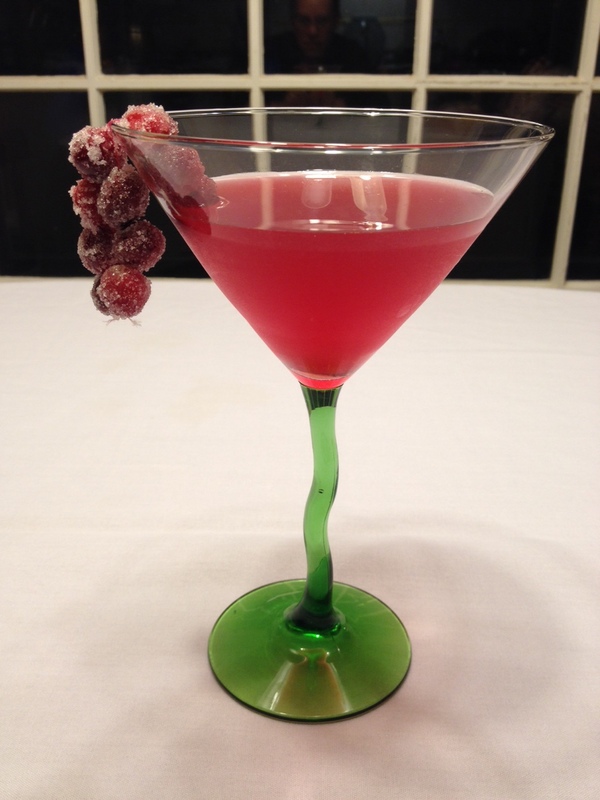 I created this cocktail for a Guilty Pleasures Book Reviews holiday traditions post. Isn’t it pretty? I did all sorts of things with sugared cranberries that year: I put them in the kids’ lunches, I put them on cakes, I grabbed a few every time I got in the fridge…but putting them in a drink was definitely my favorite way to enjoy them! Stir juices and simple syrup together. Garnish with sugared cranberries. You can string them with thread and hang them on the side of a martini glass if you are feeling fancy. Or you can sling them in a mason jar and call it good. Both delicious! Bring the sugar and the water to a simmer and pour it over the cranberries. Don’t bring it to a rolling boil or it will be too hot, and all the berries will crack. If they crack, then the berries will be wet – delicious, but wet! Let the berries sit in the sugar syrup overnight, or at least 8 hours. Drain the berries. Drain them well. I put paper towels in the bottom of a bowl and fish the berries out with a slotted spoon. Save the sugar syrup, which should now be a lovely pink color and will heretofore be referred to as “cranberry simple syrup.” Why do you drain the berries so well? Because less simple syrup clinging to the berries equals prettier berries. You need them to be damp, but not dripping. Toss the drained berries with the superfine sugar. I do it in batches to keep the superfine sugar from getting too wet…and I also save the leftover superfine sugar for the next batch of cranberry simple syrup. I store them, uncovered, in a single layer in the fridge.